A few years ago, I stumbled on a web site which was just one static image. The web site was for a small ramen restaurant in Zürich, and the image was just a simple poster with the basic information: address, opening hours, phone number. Better privacy – if the image is downloaded directly from the web server, no third party is involved, no cookies are set. Better security – if only one static resource is loaded, the attack surface is greatly reduced. Graphically stable – the web site will have the same layout regardless of installed font, web browser, etc. Portable – the image will display fine on any web browser that supports PNG. 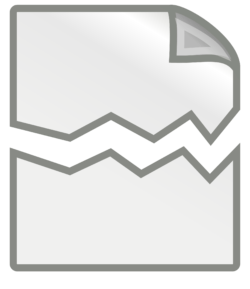 Sharable – the content of the web site can be saved on any device, forwarded by instant messaging without having to worry that the web-site will be turned down, blocking your particular address or anything like that. I suppose the logical continuation of that idea would be to use a web server that can only serve static resources, maybe even link the image inside the binary, so there is just one, read-only binary running in isolation on the server. Modified outlines so the document looks like it’s ripped in half. 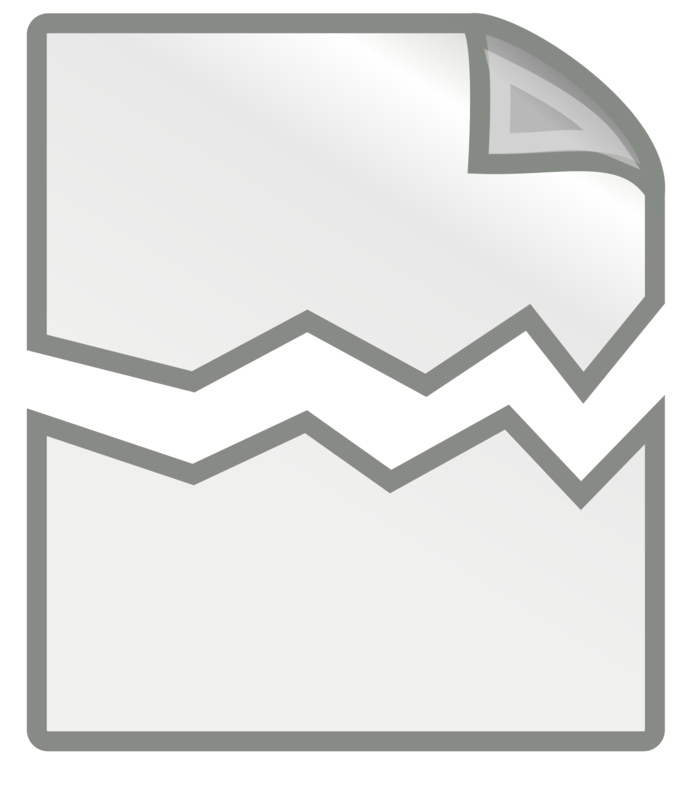 Intended to look like a “broken document”, similar to what web browsers show if a downloaded image is corrupted. The image was cropped to have less blank space. Image licensed under the Creative Commons CC-BY-SA 2.5. This entry was posted in Computer Science, English, General, Guru Meditation, Ｗeb and tagged HTML. Okay, I think I understand what you’re saying now. Yes, a text file is uglier, no argument there. I’m not sure I follow what you’re saying about ASCII—if the file is encoded correctly and served with the right headers, is there a significant section of users who will not be able to access the content? d) the underlying renderer can handle that character set (many writing system require different compositing rules / features than latin text). a) Is difficult to fix if you cannot control the web server (rented hosting). c) user cannot easily install font on mobile devices. d) typically requires an operating system update (which might never come). I cannot make any statement of what proportion of the users would be hit by which issue, but I can say that I regularly encounter web-pages with encoding problems (typically pages in iso-latin or one of the Japanese encodings with missing or incorrect headers). Gotcha. Thanks for explaining (and in particular for mentioning your personal experience, which is what I was most curious about). All that makes sense. Re: a), does meta http-equiv="Content-Type" have any effect in that situation? I haven’t yet come across devices that aren’t able to handle Hindi (which is practically built out of ligatures) and Urdu (which is practically built out of ligatures as well as written from right to left), the two languages I’m most familiar with other than English, even though they’re both rather Indo-centric and not well known to people outside the subcontinent. Of course, both of them are reasonably well supported in Unicode, and I’m not fluent in any languages that aren’t, so that’s why I was wondering about what the practical issues are. The meta http-equiv=”Content-Type” is only available for HTML, not plain text. Now I agree that some reasonable subset of HTML would probably be the solution – I’m pretty sure my home page https://wiesmann.codiferes.net renders pretty much everywhere – the problem is, I don’t think there is a clear idea on what that reasonable subset is, nor do I know tools available to the general public that generate documents in that subset. Welp, Windows XP SP2 seems to handle Hindi and Urdu mostly fine (a few rendering quirks, but still comprehensible). I couldn’t comment on the PS2 web browser, which I can’t find information, or a cheap Eastern European mobile phone, which I don’t have. But your point is taken. Again, I wonder: is the set of visitors to your site from a PS2 or a cheap Eastern European phone larger than the set of visitors who can’t see images? I guess that’s a question each site would have to answer for itself. That’s right about Content-Type, sorry—I got mixed up and forgot we were only talking about plain text. I think the subset you’re talking about will be different for different sites, since, as you’ve been saying, everything excludes /someone/… this is a complicated situation indeed. I appreciate the discussion. I’d never considered how a text document could be less than universal.